Thank you for contacting me regarding America’s waterway infrastructure. I appreciate your taking the time to make me aware of your concerns, and I welcome the opportunity to respond. I have long been a tireless advocate for more than 15,000 inland waterways jobs in Kentucky and have used my position as a senior member of the Senate Energy and Water Development Appropriations Subcommittee to advance Kentucky’s inland waterways projects, including the Olmsted Locks and Dam project and the Kentucky Lock and Dam project, among others. You may be interested to know that I was honored by the American Maritime Partnership by being awarded the Champion of Maritime Award in 2014. As you may know, the U.S. Army Corps of Engineers (USACE) undertakes projects to maintain and restore the nation’s waterways, which are authorized by Congress in Water Resources Development Acts (WRDA). Additionally, WRDA provides for the conservation and development of water resources and authorizes various projects for improvements to rivers and harbors in the United States. In your correspondence, you expressed your support for the WRDA of 2016 (S. 2848). This legislation supports several projects in Kentucky, including one that will transfer aging infrastructure along the Green and Barren Rivers in Kentucky over to state and local entities so they can determine the best use of this infrastructure, and one that will help the citizens of Paducah better protect themselves from flooding from the Ohio River by helping complete repairs to the city’s flood protection infrastructure. This legislation also includes assistance for the families affected by lead poisoning, like those in Flint, Michigan, including $100 million for drinking water emergencies, $70 million to subsidize loans for water infrastructure projects, $50 million to help communities comply with drinking water standards, $30 million to reduce lead exposure among children, and $20 million to develop a national lead exposure registry. Like you, I am very appreciative of the importance of our nation’s inland waterways and flood mitigation infrastructure to our nation, and to the Commonwealth. 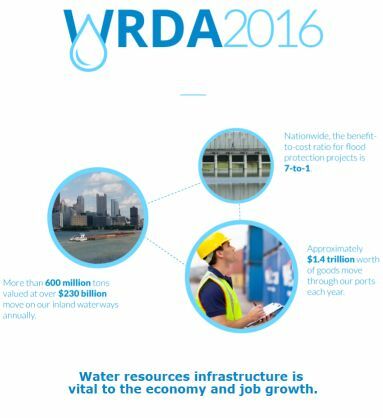 I am also aware of the importance of WRDA to workers and businesses that rely on our nation’s waterways. For this reason, I was proud to support the WRDA of 2016, which passed the Senate by a vote of 95-3 on September 15, 2016. You may be interested to know that the House of Representatives passed their version of WRDA (H.R. 5303) on September 28, 2016 by a vote of 399-25. Please know that as the House and Senate work towards resolving differences between the two versions, I will be sure to keep your thoughts in mind. Again, thank you for contacting me about this important issue. If you would like to receive periodic updates from my office, please sign up for my eNewsletter at http://mcconnell.senate.gov/, become a fan of my page on Facebook by visiting http://www.facebook.com/mitchmcconnell or follow my office on Twitter @McConnellPress. In the meantime, I hope you will continue to keep me informed about issues important to you. Previous PostPrevious Dr. J. Thomas Ungerleider, a UCLA psychiatrist who was among the first researchers to prove the medical benefits of marijuana, has died.